Emerging from the Dark Ages, scholars concerned themselves with matters of magic, issues of theology and creative – if nonsensical – arguments such as the Flat Earth Theory. Among those who queried the absurd, Thomas Aquinas is thought to have been the first to ask that fabulous, unanswerable question, How many angels can dance on the point of a very fine needle, without jostling one another?” Perplexing himself with such paranormal nitpicking must have been disappointing, for it appears that the number of angels has never been ratified. Perhaps he should have gone out more? But just as medieval mystics exercised their brainpower on these metaphysical musings, similar unfathomable mysteries still abound in the 21st Century and cannot be dismissed. Contemplating this conundrum is indicated if one is confronted by the incredible shrinking domain combined with an ever-expanding Carlton Ware display. Drastic solutions may therefore be considered: stop collecting altogether and live in minimalist bliss; or buying a stately home – none of which is possible at this time. Other options are taking up philately instead; or pruning ruthlessly and with great sorrow. 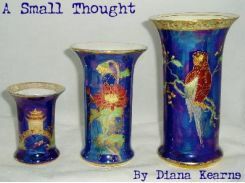 Nevertheless, a more pleasant – albeit somewhat temporary – measure is to think small and buy petite, pint-sized, even miniscule pieces; and consequently live happily for a lot longer. Fascination for miniatures has featured in the art of many civilisations throughout the ages. Over the centuries Far Eastern and Asian cultures produced quantities of fine, intricately carved figurines and minute, bejewelled curiosities; these delicate trinkets are collected worldwide today for their beauty and fine craftsmanship. One example is the Japanese netske (or netsuke), a small toggle that was used to counterbalance the container (or inro) worn suspended from a sash by men to store items of everyday use, in the absence of pockets. The netske became an item of high fashion, skillfully wrought from ivory or wood into teeny animals, birds and sea creatures, portraits of dancers and demons or droll cameos of characters from everyday urban life. These superbly crafted netske are avidly sought after by collectors and continue to be worn by the Japanese on ceremonial occasions. 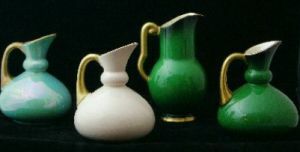 Diminutive and decorative works of art, including mini-portraits painted on porcelain, were produced, admired and sought after throughout European high society for hundreds of years; however the Victorians, who obsessed over just about everything, took the art of the miniature to new heights. Divine, yet useless knick-knacks, for example the ubiquitous cameo, exquisite little sewing kits or tiny booklets bound in gold and studded with precious stones – enclosing nothing more than pages of ephemera such as weather forecasts and phases of the moon (a classic combination of the sublime and ridiculous) – were all the rage. From its inception in 1890, the Carlton Ware works naturally produced something for everyone: from the gloriously huge – Derek and Jane’s magnificent 25″ jardinière and stand (first showcased in CW3’s quarterly magazine The Carlton Comet issue 5), to the tiniest – this rare, BROWN LUSTRINE handled pot which stands a mere 1½” high, shown here with a 2½” BLACKBERRY butter pat dish and a 1½” Clarice Cliff Autumn Crocus quatri-footed dish. 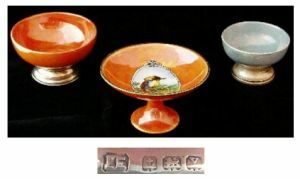 Souvenir ware was manufactured for ease of transportation, and was therefore characteristically of minimal dimensions. 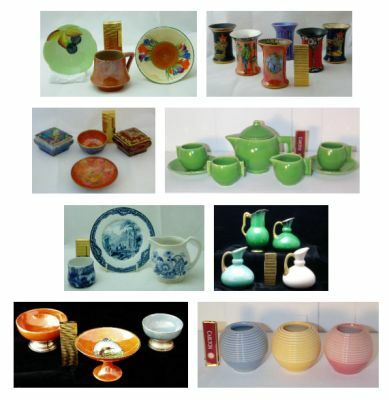 This area of collecting is a category of its own and was the subject of an article in Newsletter # 22. 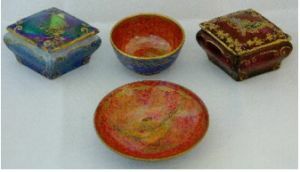 Many potteries produced tiny replicas of their larger wares, some perhaps as tradesmen’s samples. These small pieces demonstrate how their patterns were reduced accordingly, while others depict only a portion of the overall design. Crown Devon’s Sylvan and Royal George Lustrine were first introduced at the 1924 British Empire Exhibition at Wembley. The sailing dinghy on this tiny blue Lustrine snuff box represents only a small element of the overall seascape depicting a majestic galleon in full sail. The elegant and enduring Crown Devon Royal George pattern commemorates an historic and mighty 18th century 100 gun warship of the same name. The stunning Sylvan Lustrine and its sister design Rural Lustrine also enjoyed continuing popularity over many decades. The wonderful Sylvan butterflies, hand-enamelled in brilliant colours on mottled blue or ruby lustre ground, were wreathed by lavishly gilded ivy leaves and, on larger pieces, fluttered past gold “pointillist” style tree trunks. Created for Wedgwood in 1917 by the celebrated artist, Daisy Makeig Jones, Flying Humming Birds formed part of the Ordinary Lustre series, which preceded her fêted Fairyland Lustre ware. Numbers Z5088 and Z5294 were allocated to the Flying Humming Birds patterns which, with their own exclusive border of Flying Geese, became a highly successful range. Children’s or dolls’ tea sets were produced over the years but few survive, having been sacrificed whilst fulfilling the purpose for which they were intended. For this reason, an entire vintage children’s tea or coffee set is a rarity and, to remain intact, must have been carefully replaced in its box once the well-intentioned benefactor had departed; or stored reverentially in a cabinet, safe from the clumsy attentions of its young and rightful owner. This delightful Carlton Ware children’s tea set in the MODERNE shape is complete and very desirable. Keith Murray promoted the principles of modernism, encouraging the concept that simplicity and sculptured shape were the keys to modern design. Carlton Ware’s tribute to Keith Murray was its ENGINE TURNED ware, produced in various sizes and shapes, in plain, pastel colourways. With groaning cabinets and a collection which started in 1978, is it possible to discipline oneself to consider nothing but items that are small, yet perfectly formed? If so, without resorting to the use of microscope and tweezers, there is hope on the horizon for the passionate hoarder. The beauty of the miniature is that its tantalising detail is dedicated to the personal pleasure of its owner. It is a private, joyous secret that is hidden from the casual observer and, more to the point; it takes up a lot less space. In order to dispel any visual illusion as to the sizes of the above pieces, we have also photographed each group using similar cigarette lighters – Ian and Jerry’s Carlton lighter being most apposite!